If you are looking to add a little sparkle to your pedigree, or if your paper files need an organizational face-lift, then Legacy Family Tree's color-coding is just what you need. In the Pedigree View, navigate to yourself. (You don't have to be in the Pedigree View, but it makes it easier to see the effect of the color-coding. Click on the Apply Color Coding button. You and your father's father's ancestors are now blue. Your father's mother's ancestors are now green. Your mother's father's ancestors are now red. Your mother's mother's ancestors are now yellow. Click on Options > Customize > View tab. In the Ancestor Color Coding section, click on the Change button. Select your desired colors, and click Save. Click on the Reports icon in the main toolbar. Click on the Pedigree tab. Click on the 4th option of 4 Line Colors. Click Save. You've probably learned that unless your paper files are in order, further genealogy research can be frustrating. You've also probably tried dozens of different organizational systems. Not every system works for everyone, which is why we have been publishing different methods via Legacy News. Mary Hill developed a color-coding system for organization which has become very popular, and it works directly with Legacy's color-coding system. Her system is explained here. To take advantage of Legacy's color-coding, you must be using the Deluxe Edition. To learn more about the Deluxe Edition click here. To purchase/upgrade to Legacy Deluxe, click here. You know you're REALLY hooked on genealogy when the majority of hits that come up when you Google an ancestor's name are your own queries on the genealogy boards! Thanks, Karl, for sharing this with us! The U.S. Indian Censuses are among the most important documents for tracing Native American family history – as well as the place for anyone with Native American ancestry to begin searching for their heritage. Representing more than 250 tribes from some 275 reservations, schools and hospitals across the United States, the censuses typically recorded names, including Indian names, ages, birthdates, tribe, reservation and most importantly the Allotment/Annuity/ID number, otherwise known as the Census number. Some earlier rolls even listed the member clans, a very important relationship identifier. Ancestry.com subscribers have access to these records by clicking here. At the FamilySearch Labs site, click on the Register to use Record Search link. You may be selected to participate. If you are, you will have free access to the above records where you can help FamilySearch test their services and provide valuable feedback. FamilySearch plans to make their records available for free to the public. Visit http://search.labs.familysearch.org/ to get started. This morning I was using Legacy Family Tree's Relationship Calculator to determine the relationship between two ancestors of mine. Knowing that Legacy will report all known relationships between two persons, I calculated the relationship between myself and my mother. I was shocked with the findings. I called my mom (6:30am) and instead of saying "Hi Mom" I said "Hi there 12th cousin!" Apparently, my dad and my mom share the same common ancestor - Richard Kimball, who was born in 1595. Somehow, Legacy determined that because of this relationship, I am my mom's 12th cousin. In the Family View, locate yourself. Click on the Tools menu, then click on Relationship Calculator. Your information is filled in on the left. Now click on the Select Right button, locate the person to whom you wish to calculate the relationship, and click Select. At the top right of the screen, the relationship is listed. If there is more than one relationship, there will be more than one couple in the Common Ancestors section. Just click on the other couple, and their relationship to you will be presented in the upper right. Not only is my mom my 12th cousin, but we are also 15th cousins, and 15th cousins once removed. My wife and I are 13th cousins, which makes my mother-in-law my 12th cousin once removed. Knowing that my mother-in-law and I share common blood, we try harder to get along! PROVO, Utah, June 18 /PRNewswire/ -- A new partnership seeks to reunite families through science. The Generations Network, parent company of Ancestry.com, has announced it will combine its unrivaled collection of online family trees and historical documents with Sorenson Genomics' precision ancestral DNA testing. This unique partnership promises to revolutionize family history by allowing people to trace their roots and connect to distant cousins through DNA at the click of a mouse. Ancestry.com boasts more than 14 million users and the world's largest collection of online family trees. In the last 12 months alone, more than two million people have built family trees on Ancestry.com. Sorenson Genomics is one of the world's foremost laboratories for genetic genealogy testing services, and has been helping genealogists extend branches of their family trees through DNA analysis since 2001. "Entering the DNA category is a natural and powerful extension of our company's mission to connect families across distance and time," said Tim Sullivan, CEO of The Generations Network. "Our partnership with Sorenson Genomics creates an incredible combination of resources designed to demonstrate how closely we are all related." By taking a simple cheek-swab test and comparing results against DNA profiles in a test-results database, virtually anyone can uncover genealogical associations unimaginable just a few years ago. Users can easily connect with and discover lost or unknown relatives within a few generations, as well as gain insight into where their families originated thousands of years ago. In the coming months, Ancestry.com will release technology that captures DNA test results in an ever-expanding, searchable database. Using this database, users can easily identify distant cousins and tap into thousands of hours of already-completed genetic genealogical research, breaking through family tree dead-ends or barriers such as missing or inaccurate records and name changes. Ancestry.com is also developing technology that will allow users to integrate DNA results with the historical documents already in their online family trees. "DNA research becomes more meaningful to people searching for relatives as more peoples' DNA results become part of the database," said Doug Fogg, COO of Sorenson Genomics. "By combining the powerful networking effect of Ancestry.com's extensive user base with Sorenson Genomics' industry-leading DNA testing capabilities, this partnership will dramatically alter and expand the DNA testing services marketplace." Prior to the current partnership, Sorenson Genomics provided DNA testing and database matching services through its direct-to-consumer genetic genealogy division Relative Genetics. This new partnership agreement brings former customers of Relative Genetics and its DNA database under The Generations Network's umbrella. Sorenson Genomics will now provide DNA testing services for The Generations Network, and Ancestry.com will market DNA testing and database-matching services for genealogy purposes. Results of the Relative Genetics' DNA database will be included in Ancestry.com's growing database. Did you know that in Legacy Family Tree you can record your DNA results? From the Individual's Information screen, click on the DNA button, select your test results, and record the information. I notice that in the Family View, some of the children are blue and some are red. What do the colors represent? In fact, these colors are also used in the Descendant view, Index view, and the Name List. Legacy is flexible enough that you can change these colors to anything you want. Just click on Options > Customize > Colors tab. Here, just click on the male or female label and select your favorite color. Does the Family History Library have it all? When I began my research, I used to think that the Family History Library had everything. Although it is the finest library in the world in which to research, I'm glad I learned about the availability of records that they don't have. We recently were searching for Lewis KING, born about 1807 in Baden, Germany. His first child was born abt 1836 in Erie County, New York, and he moved to Iowa in 1856. We exhausted all the "normal" and easy-to-locate sources for Erie County for the time period, so we turned to the state census records. The Family History Library Catalog's earliest state census record for New York was 1855. We located Lewis KING's family in the census which revealed information about when the family first came to Erie County. If we relied solely on the holdings of the Family History Library we never would have broke through our brick wall. The answer to our problem came through the suggestions in Legacy's Research Guidance. Because we were trying to find evidence of Lewis KING's birth, we clicked on the "Goal: Birth" tab. Instantly, Legacy provided 74 suggested sources - all of which may contain information about his birth. One of the records Legacy suggested was the 1845 New York State Census. These records were absent from the collections of the Family History Library. Not only did Legacy suggest this source, but it explained what information might be contained in the source, and where the source is located - at the New York State Library. Click on the image below to view this suggestion in Legacy. Had we relied on the Family History Library's Catalog, we may not have learned about the availability of the 1845 state census, and the brick wall would remain. Is Legacy's Research Guidance just for beginners? Ask any professional researcher - they'll probably tell you that it is difficult to always remember all of the available sources. While Legacy's Research Guidance is perfect for the beginning genealogist, even professionals benefit from the checklist-style approach. 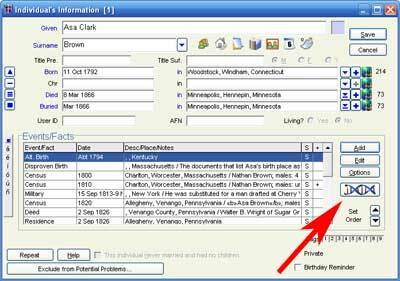 Once you've opened Legacy Family Tree, locate the individual for whom you want suggestions. Then click on the Research Guidance tab in the upper right. Finally, click on the Start Now button and Legacy will guide you through your research. Research Guidance is available in the Deluxe Edition of Legacy. Learn more about the Deluxe Edition features, or click here to purchase. FamilySearch has recently announced new services to be offered via Family History Centers. Free access to databases at Footnote.com, Godfrey Memorial Library, Heritage Quest, Kindred Konnections, and WorldVitalRecords.com are among these offerings. While they are not yet available, they will be in the near future. Family History Centers are branch facilities of the Family History Library in Salt Lake City. Centers provide access to most of the microfilms and microfiche in the Family History Library to help patrons identify their ancestors. Most centers are located in meetinghouses of The Church of Jesus Christ of Latter-day Saints. They are administered and operated by local Church members. Everyone is welcome to come to the centers and use the resources. There are more than 3,400 centers worldwide. To find a Family History Center near you, go to Find a Family History Center.